Our biggest event of the year is coming up fast! 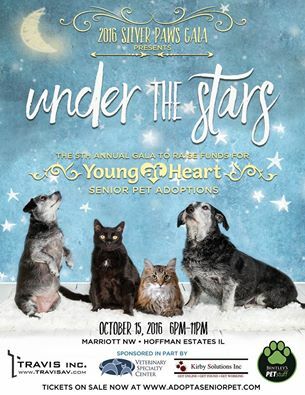 Young at Heart's 5th Annual Silver Paws Gala - Under the Stars is coming up on October 15th, and its a night full of love for senior pets. Tickets are going like hotcakes and are over half way to sold out! Last year's gala raised $100,000 for senior pets in need, and was a blast! If you want to donate an auction item such as gift cards, sports/concert tickets, hotel stays, restaurant certificates, behind the scene tours, memorabilia, or other fun silent or live auction items, now is the time as the deadline is this Friday 9/1! Businesses have until 9/15 to join in this amazing night as a sponsor. Tickets, item donation, and sponsorship info are all online at http://www.adoptaseniorpet.com/events/special-events/silverpaws. Be a part of this incredible night "Under the Stars" to build a brighter future for senior pets in need! We can't wait to see you!